(#WorkLoadWednesday) My son and I enjoy watching the History Channel TV Show American Pickers. The hosts, Mike and Frank, travel the United States in their white van searching dirty barns and attics looking for antique treasure to cleanup and re-sell. I marvel at their ability to look at a piece of dusty old “junk” and know that when it’s cleaned up, it still has value. Sometimes-significant value. The same could be said for your blog archives. Have you looked through your blog archives recently to find hidden gems? As you are well aware of, blogging and social media requires time. If you are like most, you want to reduce the time (and cost) it takes to create content so you can spend more time on other projects or customers. Like Mike and Frank do, searching for discarded and seemingly useless junk, look through your old content, select a few pieces worth reviving, dust them off, and replay it across social media. The core content of the post will likely still be valuable. It may just need a few tweaks. Use blog analytics as your guide: Find your top three posts that continue to get traffic. Update the call-to-action: Are the pages optimized for the one metric that is important to your social media success today? Update the content: Things change. Update the content with the latest information. Replay it: Give it a new title when you share it across social media. For example, one of our best performing blog posts was written in June 2013. It continues to drive organic traffic. As you can see in the example below, we highlighted a new call to action on the page in June 2014. Your updates don’t have to be that prominent but we felt the update was significant enough to warrant a call-out like we did. Cleaning up a few old blog post gems and replaying them in social media cost nothing but a little bit of time. The payoff is significant. 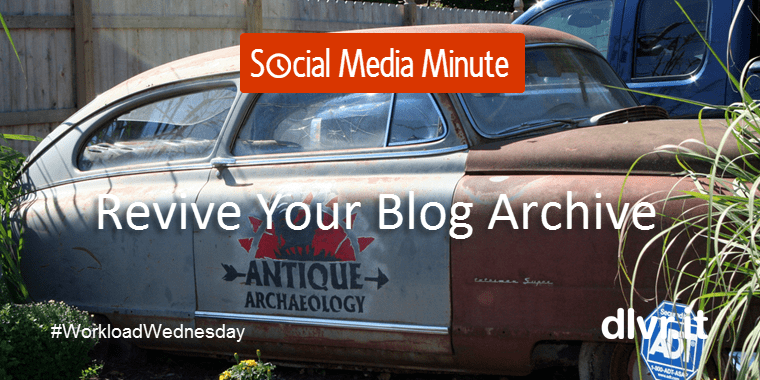 Reviving archived content will save you the time of creating a blog post from scratch while still affording you the benefits of a new article. You’ll definitely put more time back on your schedule. Furthermore, by replaying the blog post in social media, you will definitely see a boost in traffic. Keep the URL the same. Update the content within the particular post using the existing URL to keep hold of its SEO value. Change the date. Some blogging platforms allow you to change the publish date, enabling you to keep the URL but show it on your blog as a brand new post. Limit the ‘cleaning.’ Mike and Frank will tell you, don’t over clean an antique. You might destroy the value. Same thing with a blog post. You could lose significant organic search traffic. Run it through a tool like Scribe to see how the revised post ranks. Now it’s your turn. Look through your archived blog posts to find a gem. Clean it up and replay it in social media. It only takes minutes to do.